Gagdad Bob said... Interestingly, the Mother--Sri Aurobindo's collaborator--wrote of how Hitler was inhabited by a demon, or "asura," that would take control of him, whereas Stalin was actually a rarer type, in that he was literally without a human soul.I'll have to find the exact passage. Bryan said... Hi Dr. Bob, Concerning the Mother's remark about Hitler and Stalin, does contemporary Western psychology have an explanation about what it means to be possessed by an asura on the one hand or not to have a soul on the other? Is an asura a particularly bad mind parasite? Gagdad Bob said... Bryan--No, when you get into the realm of asuras, you're dealing with an entirely different ontology taking place on an another plane. There's a little footnote in my book to that effect, p. 285, f. 104. I spoke there only of higher entities. As for the lower ones, some people believe they are independent agents, others think they are quasi-independent human creations that have become detached from the psycho-cosmic system. When you look at the magnitude of nazi or Stalinist or Islamist evil, it seems to go beyond human bounds, beyond anything explainable by the categories and methods of psychology. Of course, psychologists can pretend they understand, But they're only pretending. dilys said... Well, there seem to be people with especially discriminative levels of insight. I don't know the Mother, so have no opinion about her, but none of these taxonomies are impossible. Tusar N Mohapatra said... It would be more appropriate to look at The Mother's identification of the four Asuras rather than selectively revile political adversaries...The emotions would be more nuanced once we recognise the perennial nature of the antagonism, best expressed in the Vedic imagery of Vritra, the serpent. The four Asuras represent an evolutionary road-block, they are yet to be annihilated. Only the Supramental Descent can handle that. The Mother simply asks us to collaborate, nothing more, nothing less. Gagdad Bob said... Tusar-- You can wait for the Supramental Descent to vanquish evil. You can also wait for it to fix you breakfast in the morning. Something tells me you won't wait for the latter. Hunger is too important not to fight. Will said... My new T-shirt reads: "I asked the Supramental Descent to prepare me a continental breakfast and all I got were these d*%# wheat thins." On November 1, 2004 , the President of India, Dr. A.P.J. Abdul Kalam, paid a visit to Auroville. Accompanied by the Lt. Governor of Pondicherry , the Chief Minister of Pondicherry and the Minister of Education, Tamil Nadu, the President arrived at the town-hall about 8 pm. where a representative section of about 60 Aurovilians was assembled. After listening to some presentations on Auroville and addressing the community, the President visited the Matrimandir. The President, aware of the international seminar on sustainable water resource management held in Auroville in September, had asked to be informed about salination of groundwater, in particular about the hydrological modelling of the saline intrusion in the Vanur aquifer. Gilles Boulicot from Water Harvest presented the problems in a nutshell. After having thanked the President for his inspiring message for the conference, Gilles explained that the problem of saline groundwater is not yet properly understood. The system of aquifers beneath Auroville is complex, and not yet sufficiently studied. Gilles showed how groundwater level in the Vanur aquifer, the main aquifer for the area, has gone down from 7 metres above sea level in 1975 to 37 metres below sea level now. Electro-conductivity tests indicate that the salinity in 2002 was relatively limited, but that today the entire area is above the acceptable limit for irrigation and drinking water extraction purposes. But it appears that the salination is not caused by seawater intrusion, but rather by a natural saline aquifer that is situated below the Vanur aquifer. Based on simple models and the data available, Gilles presented the expectation that already in 2010 one third of the aquifer would be contaminated, and that the entire aquifer would be saline by 2050. Gilles stressed that more studies will be required to determine the origin of salination and come up with means to battle it. He mentioned that cooperation between institutions and stakeholders of the area is required, such as with the Indian ONGC, the Oil and Natural Gas Corporation, which did an investigation in the area about five years ago but which has, so far, not agreed to share its data. Gilles concluded his presentation expressing his hope that Auroville will be instrumental to transform this area into a pilot area for sustainable development. Pondicherry Feb. 21. The President, A.P.J. Abdul Kalam, who inaugurated the Aravind Eye Hospital at Abishegapakkam, near here, told the gathering at the function that he and his friend, Rajam, while flying to Pondicherry from Chennai today, composed a short poem on the hospital chairman, G. Venkataswamy. Dr. Kalam visited the Aurobindo Ashram. The President was received by the Managing Trustee, Manoj Das Gupta. Dr. Kalam visited the rooms of Sri Aurobindo and the Mother. He had a talk with the children of the Sri Aurobindo International Education Centre, in the ashram. Devotees from different parts of the country thronged the Ashram to pay homage to Sri Aurobindo and the Mother on the occasion of the Mother's 125th birth anniversary. Tuesday, February 21, 6pm Graham Foundation, 4 West Burton Place, Chicago Extended through Thursday, May 25, 2006. Gallery hours are Monday through Thursday from 10am to 4pm. 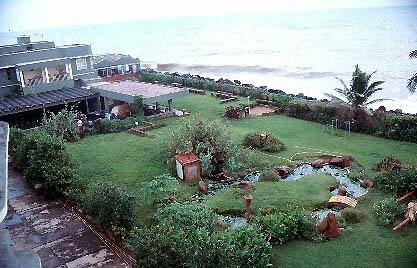 Sited on the coastal edge of the Bay of Bengal, Golconde, a dormitory for the Sri Aurobindo Ashram in Pondicherry, India, was designed by architects George Nakashima and Antonin Raymond. Golconde is a remarkable architectural edifice, seamlessly negotiating between the tenets of early modernist architecture while addressing the pragmatic impositions of a tropical context. Espousing radical economy and uncompromising construction standards, it proposes environmental sensitivity as a foundation for the design process. Completed in 1942, Golconde was the first reinforced, cast-in-place concrete building in India and clearly celebrates the modernist credo: architecture as the manifest union of aesthetics, technology, and social reform. This exhibition assembles construction drawings, architects' letters and journals, and extensive photographs of this extraordinary building. Even for the most discerning and intelligent it is quite difficult to recognise the Asura behind his appearance, as it is a stolen body of the Divine Lord, stolen from a plane of divine formations. He is capable of stealing anything that comes across his way, people's faith and their little energies. He can create in their bodies diseases and lead them to a collapse, and save them from death by a wielding a miracle and claim to have saved them. He is a very powerful Asura, in fact the most powerful in his type. He is a direct appearance on earth, a formidable power that seeks to destroy the supramental work by trying to destroy the divine instruments. Pondicherry, with its French heritage, is unlike any other part of India I've seen. It also contains a lot more westerners than anywhere I'd seen (before reaching Agra). Despite the hype I found that there were two attractions. The first is a chance to break from eating curry and rice, served on banana leaves, with your (right!) fingers and get some traditional French meals. The second is the Sri Aurobindo Ashram. "Founded in 1926 by Sri Aurobindo and a French woman known as the mother, this ashram . . . propounds spiritual tenets that represent a synthesis of yoga and modern science." (LP) The ashram seems to own half the town, a fact which has apparently caused some local contention. Visitors file passed the tomb of the founders which lie, well decorated, in the ashram courtyard. I stood in the unusual (for India) silence and wondered what exactly these people had done to leave so many people praying to a couple of corpses. Last few months I have not posted anything here. I suppose I am not in a sufficiently "surrendered” state of mind to create words that bear the true imprint of thankfulness. I will wait until that occasion when I am seized by gratitude and my innards start throbbing with renewed awareness of how others contribute to my happiness. Am not really surprised at the results. These are an indication of an incomplete yogic process that has been set into motion ever since the obstacles and difficulties were seen. It is to be understood, not be otherwise, that the yogic force takes the difficulties of the nature one by one and not in a random ease of extraterrestrial spontaneity, which is perhaps why everything is taking time to accomplish in detail. There is always scope for improvement and experiment, but they have to be carried out in the full knowledge of the process and any immature attempt will only result in a failure. We traveled through many ashrams, met many yogis and gurus. We became attracted to the works of Sri Aurobindo, a freedom fighter, mystic, and highly accomplished yogi who had lived much of his life in deep contemplation in Pondicherry, India. Joined in this work later by a Frenchwoman, Mirra Alfassa, who eventually came to be known as the Mother, his great task was to anchor into the collective consciousness of humanity what he referred to as the ‘supramental force’, a force that he claimed would most surely awaken humanity into her true evolutionary destiny as a supramental species, as far beyond the current human species as humanity is beyond those who have preceded us. India has attracted a succession of architects and artists, generals and writers from France. From Le Corbusier whom Chandigarh regards as its own and Roger Anger who designed Auroville, to Joseph Francois Dupleix who plagued the British in the Deccan in the 18th century.Yes, for some French people it’s always been Vive l’Inde. The scenery was undeniably picturesque. Whitewashed houses with colonnaded balconies dominated the scene and people of varied nationalities were walking past without a care in the world. Since it wasn’t a beach, the numbers of street peddlers were in minute quantities. I saw a couple of European kids, playing with their nannies. They were speaking in Tamil, with absolutely perfect clarity in their speech and the slightest of accents. It was Pondicherry, just the way I’d imagined it to be. Aurobindo Ashram was just some distance away. The first thing that struck me about the Ashram the moment I entered it was its smallness. From what I’ve heard of the place I’d definitely expected something that was more extravagant. The ashram was structured such that a huge, imperfectly beautiful tree that branched out in a million directions was at the center. I think the tree must have been pretty old because there were beams placed below it for support. There were people of all kinds, sitting in various positions; some having a slightly dazed expression in their eyes, the others with their eyes closed. The common expression that everyone’s faces seemed to portray was that of peace. The ashram was well maintained and extremely clean which is probably why I regret not having stayed there. We eventually decided to visit Auroville on our way back to Bangalore. The drive till there was good. The road was decent and there was the ocean, stretched out beside it allowing us glimpses of its vastness from time to time. Auroville struck me as a little weird- with its Utopian ideas, prospective villas that would be called Shanti, Gratitude, Horizon etc and human beings living in harmony with each other and that sort of thing. We were showed a short video and from what I saw, I thought the Matri Mandir seemed very similar to the Lotus Temple in Delhi. The Mandir was still under construction so we could just see it from outside after walking for about half an hour with the sun shining on us in all its glory. The walk back was much nicer after having a refreshing lemonade. I concentrated a lot more on the kind of people that were around. During my brief stay in Pondicherry, I often stood at the restaurant windows or sat on my balcony watching the waves come in and go out again. It was easy to lose all sense of time, and strangely enough time as we know it seemed so meaningless. Watching the sea, your mind is emptied of every petty thought and worry. This is the perfect place to read, and think, and write. I never tired of the sound of the sea, which filled my room, its muted roar as the waters crashed against the rocks a living presence forming the backdrop of my days. Based on the philosophy of Sri Aurobindo and Mirra Alfalssa (a.k.a. "The Mother") , Auroville is a grand experiment in building human unity with the vision of becoming a universal township for 50,000 people. On February 28th, 1968 over 5,000 people from 124 nations assembled for the inauguration of Auroville. After the festivities ended, a handful of people remained to begin the task of transforming a devastated landscape into a vibrant ecosystem and a thriving international community. It worked. Today, Auroville extends over 2 square miles and is home to 1,900 members from 40 nations.